I miss Prince but not for the reasons you probably do. For years, I lived in Minneapolis and followed along as he defined outrageous and seemed to outdo himself in that category as time went by. I recall his face scrawled with the word SLAVE to protest his record label, two marriages and an annulment, the sudden and mysterious death of his seven-day old son, the changing of his name to a symbol (what?!) and back again (whew!). All this carried little weight as he turned to music again, breaking records with 21 shows at London’s O2 arena and releasing his 33rd studio album. The music and intrigue that Prince provided to Minnesota made him a favorite son and filled everyday with the possibility of the unknown; would Prince appear in public, perform at a club, or do something that, at first, we wouldn’t understand but then realize was his genius. This genius sometimes occurred at the strangest hours which frustrated even his most devoted fans, like the time he didn’t take the stage at First Avenue until 2:45am and cops closed the place down about an hour into the show. Bleary-eyed co-workers provided testament. Prince and I loved First Avenue for similar reasons but from different views: the crowd standing close, buying beers from club employees snaking their way between hot, dancing bodies, and a show that stays with you long after the night is out. But Prince also liked First Ave because it didn’t just book white rock ‘n rollers. Music writer Chris Riemenschneider recalls the love affair between Prince and First Avenue and the sweaty, summer night in August 1983 when he debuted Purple Rain, all 13 minutes of it (rare video). I miss Prince because I really didn’t appreciate him when I should have. And sadly, it took his death to realize this. Two nights after Prince died, I was standing by the stage at Barclays Center in Brooklyn on April 23, 2016 waiting for Bruce Springsteen & The E Street Band to start their final two shows of the U.S.-leg of The River tour. It was the same spot in which I stood in Pittsburgh three months earlier on opening night. That show was filled with world-premiere excitement and came within days of David Bowie’s death, a loss Springsteen and the band memorialized by starting their encore belting out a ferocious Rebel, Rebel. So in Brooklyn, 19,000 of us knew Springsteen would pay tribute to Prince, we just didn’t know how or when. Every show of the tour started with the house lights on and the hard-charging welcoming anthem Meet Me In The City Tonight. But on this warm April night, with anticipation growing by the minute, the band walked onto the stage in the dark with only their silhouettes illuminated by purple lights shining down and Purple Rain at the top of the setlist. From the very first chords, we felt we were attending a memorial service, truly THE memorial service since it was the first major concert since Prince’s death. Springsteen’s voice rose with emotion as the band lifted us musically. We were transfixed watching Nils Lofgren rip into a passionate minute-long guitar solo. We were transported by Springsteen’s verse. And we were transformed as together we cried out the final “oh, oh, oh, oh’s”, hoping that if we could just keep it going, Prince wouldn’t be gone. Before the final beat, Springsteen cloaked us in a communal embrace by calling out “Prince forever, God bless”. Purple Rain was a fitting eulogy, filled with respect and reverence and served up with honor by a preacher whose tribute was cathartic. Watch Bruce Springsteen & The E Street Band perform Purple Rain in tribute to Prince, two days after his death. Springsteen returned to Prince after his second song. “We’d like to dedicate this show to Prince. There’s never been anyone better…Bandleader, showman, arranger…Whenever I would catch one of his shows, I would always leave humbled. I’m going to miss that. We’re going to miss that.” For those of us who returned to Barclays two nights later, we were treated to Purple Rain once again, but not to start the show; this time it was the first encore, placed high atop the musical alter between Springsteen’s two greatest hits, Thunder Road and Born To Run. ​Musicians teach us a lot of things through their lyrics and how they interact with their fans. But when one musician dies, we rely on others to help us through the loss, whether it was Springsteen’s tributes to Prince and Bowie or Jackson Browne’s friendship for Glenn Frey. Respect, admiration, humility, self deprecation. For musicians who have lives we only dream of, death among their ranks makes the surviving musicians more ordinary, puts them next to us, and makes them a grieving fan just like us. 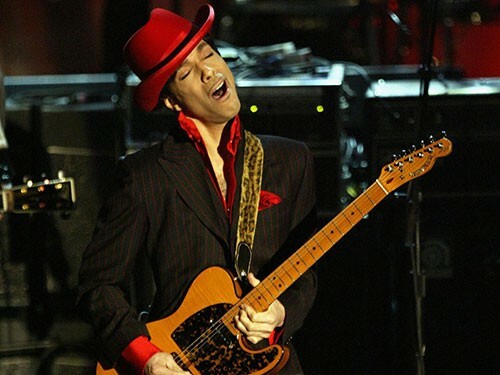 Watch Prince steal the show at the Rock n Roll Hall of Fame induction ceremony in 2004 during “While My Guitar Gently Weeps” and read why this performance almost never happened.